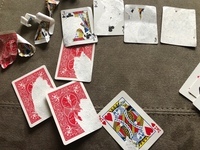 I’ve been trying to learn how to split cards using the method taught by Bennie Chickering in his Siamese Waltz tutorial. I’m finding it incredibly difficult. He makes it look so easy. Do any of you know a good resource to learn how to do this effectively? I learned from a manuscript by Dave Grippenwalt (spelling?). I think Don England may have explained his method in his Penguin lecture but I'm not sure about that. I think there's a guy named something like Vinnie Marini who has a DVD. Here are a couple of thoughts. You rap the corner on a hard surface to allow you to separate one of the three layers. You're going to peel the single layer from the double layer. I'll see if Don E explains it on Penguin. He was an expert. Gary Plants is another expert. He may have a teach-in on the technique. You're going to restore those, right? Video is great... but I still can’t do it! I just tried splitting one. I remembered a critical piece of info - you must hold the single layer against the table and peel the double layer away from it. I hadn't split a card for decades, but I did manage to split the first one I tried. You must hold the thin layer flat at the boundary where the separation is happening. Keep moving the fingers that hold the single layer against the flat surface up close to the line where the splitting is occurring. Once you get around the corner, it's easy. Be careful when the splitting line approaches the corner. Hi Evan, thanks for the links. What is the purple gadget? Rudy, I believe those are jigs for aligning and pressing. BTW you didn't mention what adhesive you will use. The artists film is supposed to offer the best results. Back in the day it was held close to the vest by many who produced gaffs. I think that the artist's film that Ray mentioned is a heat process. As I recall, you put a piece of this film between two single layers. The result is a fairly stiff card. If you use rubber cement, I believe that you glue a single layer to a double layer and the card ends up not stiff enough in my experience. Marty Martini does excellent work. I have three of his Martini Rising Cards, dozens of his Hand Made Custom Cards, and two of his Index Decks. Nobody makes them like Marty. Tell him what you want and he'll make them up for you. Excellent feedback, fellas! Thank you! Rudy-- the answer is to not split the cards. There are way easier ways to make darn near perfect gaffs. I explained my method in another thread that involves sanding. You don't get the micro-wrinkles either. I also have the Martini material and have purchased cards from him. I think the DVD from Marti Marini not only goes into splitting for gaffs, but also how to print directly on card stock with an Inkjet printer. Good stuff. Also, I'm in the group who would rather pay an expert for a gaff than go through that lengthy and arduous process. I'm into splitting hairs instead of cards. That is Todd Lassen's Gaffing Genii, for use with dry mount tissue adhesion method. Provides perfect alignment, and works like a charm! Here's another resource that is technically out of print, but you can probably find a copy if you do a little digging online. Can't believe that I almost forgot about this one! A surprisingly great resource, with a fairly comprehensive scope. Rudy, unless it's really something special, you can usually get someone to make a gaff. I can split cards, but getting them back together unwrinkled is beyond me. 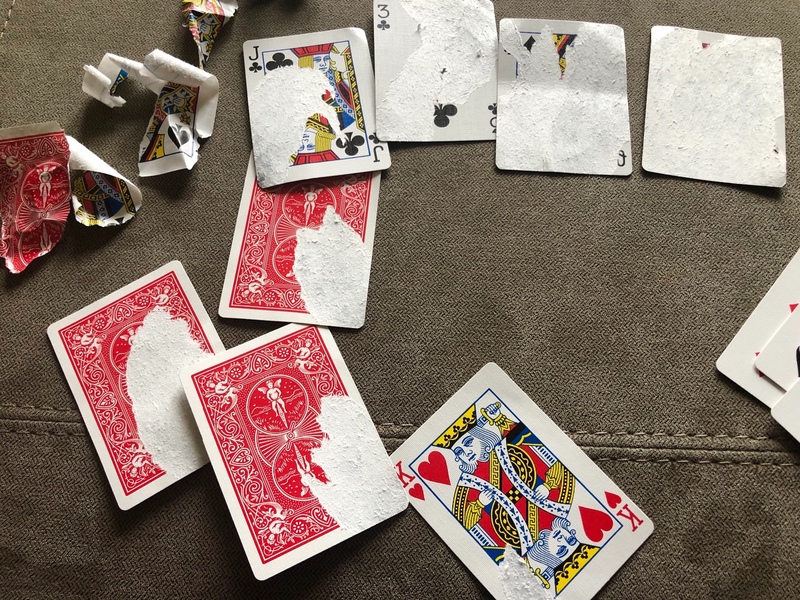 Years ago when I tried my hand at splitting cards I found that Maverick Playing Cards split easily, but putting them together was too much of a headache. A splitting headache. If you take the time to click on the above link, you will see where you can find a free preview of the resource. There is a step-by-step tutorial on how to split a card. Minimizing distortions is discussed. I have a double-backer that was made by Tim Star about 30 years ago or more. It is perfect, except a small wrinkle on one of the corners where you can tell he bent it. It creased so much that it wouldn't go away. Only noticeable to me, fortunately. I hoping that I can make session today. I feel I have a pretty good grasp on splitting, so if I can make it, I can give you some tips if you like and run through a few with you. I have made by buddy Bruce a few gaffs and he has been more than happy with them. I see that Eoin O'Hare has released a card splitter jig to help with splitting cards. I was just coming on to point that out, as well. 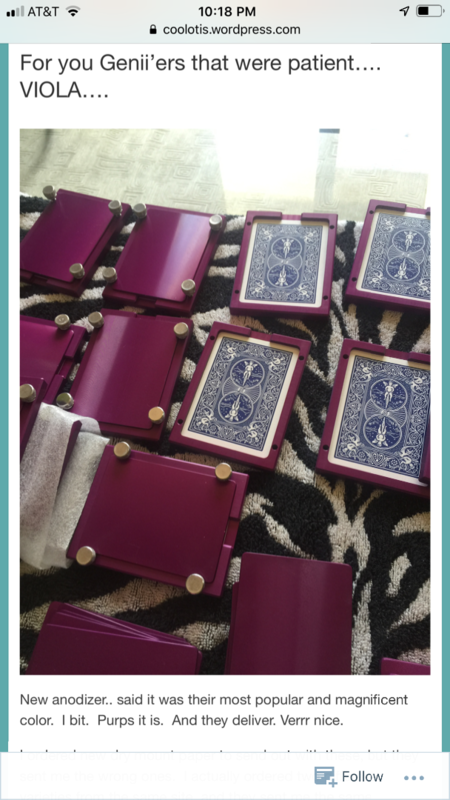 He also has a card snaker to go with it, which is initially free with purchase of the jig, or available on its own. Glutton that I am, I ordered, and will report back once I receive and have a chance to play with it all.